This article describes how to to change the data location on the Definition Center. During initial installation of the Definition Center, you are prompted for the location where you wish to store the project data. The location of the folder can be changed post-installation. This article explains how to configure the Definition Center to point to an alternative data folder. Before making any changes to any configuration files, we strongly recommend you take a backup copy. Open the file irise.properties in a text editor. The file is located in the folder \iRise\DefCenter\tomcat\conf . 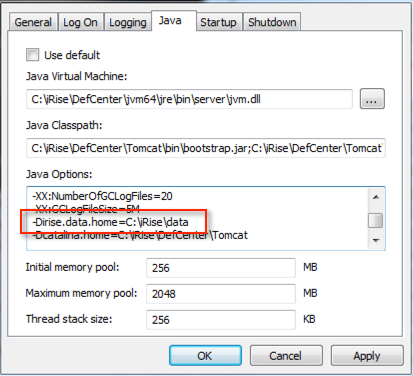 Change the location of irise.data.directory to the new data folder location (highlighted in red). 1. Open Windows services and double-click the Definition Center service. Make a note of the Service Name. 2. Stop the iRise Definition Center service if it isn’t already stopped. Note: you don't need to stop the service if you're just viewing the parameters. Only stop the service if making a change to the values. 5. Click on the Java tab in the window that pops up. Scroll down the Java Options window. The value you need to change is the -Dirise.data.home . 6. Change this to the new data location (do not use double backslashes here). 7. Apply the changes then click on OK to exit. 8. Restart the Definition Center service. Contact iRise Customer Support if you have any questions or concerns about changing your Definition Center data location.